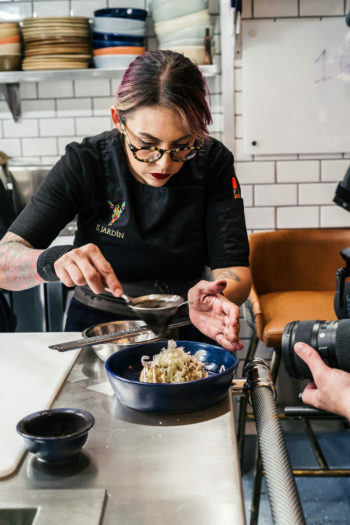 Featured on the new season of KCET’s ‘Migrant Kitchen,’ Zepeda-Wilkins' San Diego restaurant elevates regional Mexican cooking and the hands behind it. Claudette Zepeda-Wilkins grew up as a border kid, splitting her time between San Diego, California, and Tijuana, Mexico. Her parents worked in Mexico and raised their family in Imperial Beach, a California town located just a few miles from the border. She spent her childhood summers in Guadalajara and learned to cook in her aunt’s pozole restaurant. From a young age, Zepeda-Wilkins’s female relatives taught her the flavors and dishes that still infuse her cooking. Now a mother of two teenagers, she has opened a restaurant to honor the women who raised her. It’s been a busy few years for Zepeda-Wilkins, who is featured in this season of KCET’s “Migrant Kitchen.” In addition to competing in Top Chef and Top Chef Mexico, she worked in pastry at San Diego’s El Bizcocho and later as chef de cuisine at Bracero Cocina, Mexican Chef Javier Plascencia’s well-loved San Diego outpost. 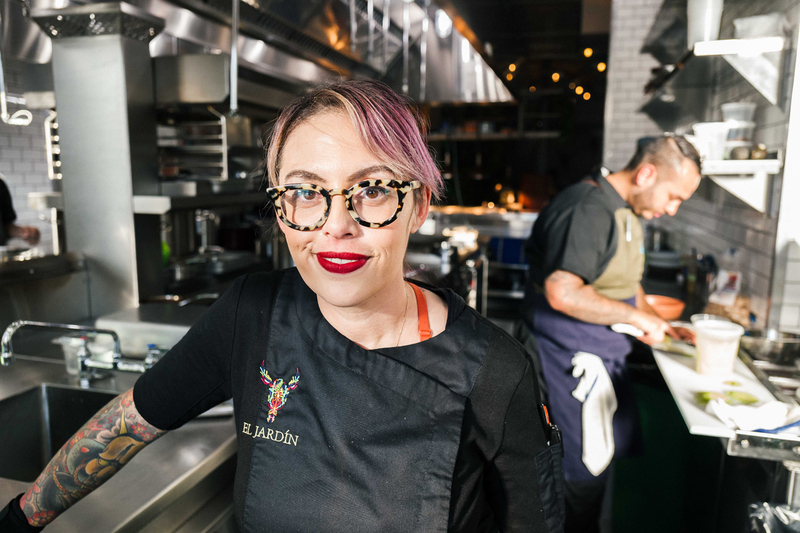 Her new restaurant, El Jardín, which opened in June in San Diego, pays homage to her Mexican heritage by making use of ingredients and recipes sourced from home cooks across Mexico, including her family members. At El Jardín, Zepeda-Wilkins not only makes food, she tells stories, too—stories of her mother and aunts and grandmothers, of her travels through Mexico, and of the women who carry on Mexico’s complex, nourishing, diverse cuisine. 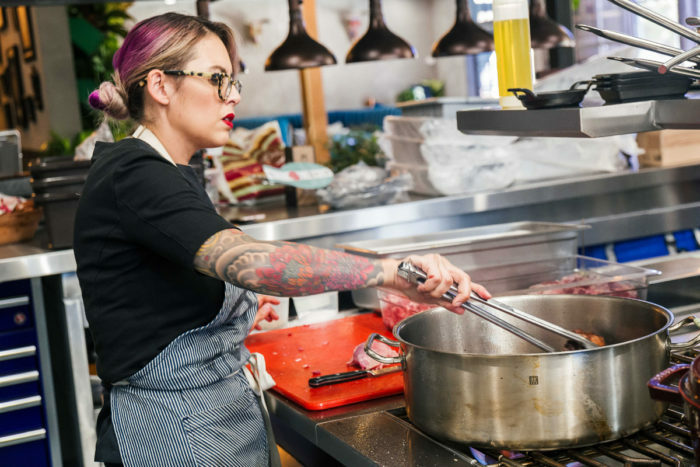 Dishes like “Jalisco Style Pozole Rojo” and “Seared Fish a la Veracruzana” are nods to her family’s history and highlight the distinct regionality of Mexican cooking. Despite El Jardín’s sophisticated take on Mexican food, Zepeda-Wilkins wants to make the dishes her grandma made—like albondigas or meatballs—and she wants to top them with greens grown in the restaurant’s namesake on-site garden, plate them on ceramics sourced from Mexican artisans, and serve them with a story. El Jardín employees are eager to share the history behind each dish, which region it comes from, and the people who inspired it. “Food is the one language we all speak,” Zepeda-Wilkins says, and it’s a language she speaks fluently. Civil Eats recently spoke to the chef about cooking on the border, the women who inspired El Jardín, and what it means to celebrate immigrant cuisine. You were taught to cook by female relatives. 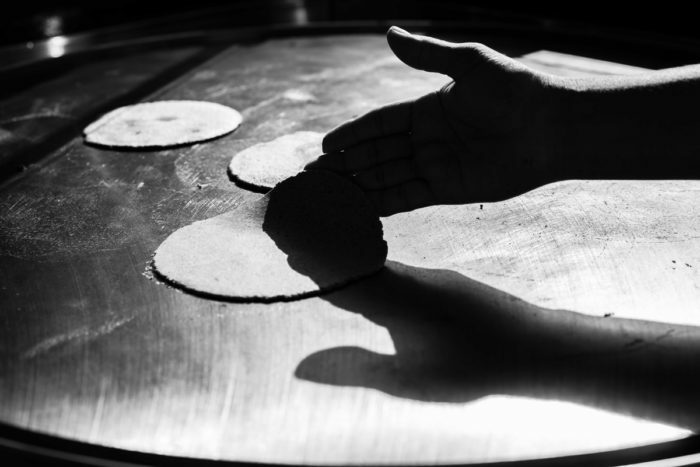 What story does your cooking tell about the women who carry on Mexico’s culinary heritage? A lot of the style and the story that resonates with me is the ability to do something out of nothing. I’m pretty sure it’s a mom-talent in general, but the ability to make—with no money—a nutritious, full meal for your family is something that I’ve seen more and more throughout my travels in Mexico. The adaptability of these women is really something that I admire. What happens to a lot of these women is that their stories go untold if they don’t have daughters. A lot of women die alone in tiny villages because the husbands emigrated to make money and send [it] back to their family. Half the time [the money] stops abruptly, and they never hear from them again. If there’s not a female to carry on the recipes of their family history, everything dies with them. How do you meet the women who inspire El Jardín’s menu and aesthetic? I have a really beautiful network of chef friends and photographers and food historians in Mexico who help me get in contact with them, and then I take care of the relationship from there. Because they have to also trust me. When I purchased my plates in Mexico, [for example] I couldn’t just pick up the phone and make an order. [I had to] actually do the work and go to Mexico and shake the person’s hand who makes them. The amount of work that goes into it is unimaginable, but it’s so worth it. For me to be able to help an artisan in Mexico—that’s the point of this whole thing. Did you always imagine opening a restaurant that focused on regional Mexican cuisine? Mexican food, yes. But the idea of regionality really manifested two years ago. Going [to Mexico] and meeting all these women to get the foundation and inspiration behind [El Jardín] came to fruition two years ago, and now I’m starting to go back, because I need to get another insurgence of creative juice. My feet need to touch that ground. I need to meet these people and eat at their homes again. Even if it’s the same meal, I come back a different person after every conversation, after every story they tell. How has the changing immigration landscape impacted food communities in the San Diego/Tijuana border region? You see Haitians who were left in Tijuana a few years ago working at the fruit stands; you go to the airport and they’re working at the tarmac. You see all these beautiful Haitian chicken spots popping up [in Tijuana now], which is really cool. That’s something people really don’t understand about Mexico. We might have all our own problems, and we might be a hot mess politically, but we are a country that accepts anyone who comes in and really embraces [them]. Really, all our cuisine is a mestiza cuisine [from the Spanish word for someone of mixed ethnic ancestry]. If you were to make [strictly] Mexican cuisine, you’d have to cut onion and garlic out, and you’d be left with just tomatoes and chilis—still delicious, but you’d miss the roundness of the flavors that are notorious for us, our holy trinity: tomatoes, onions, and chilis. 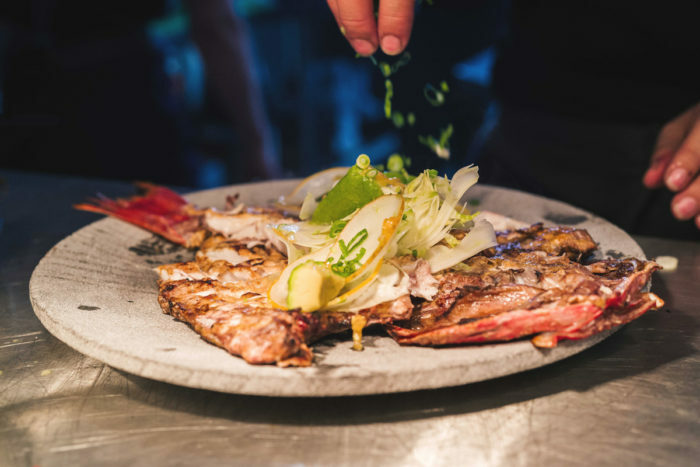 Through the seven regions [of Mexican cuisine], you can see where different cultures landed and meshed with our indigenous ingredients, and all the beautiful dishes [that] came about. What three ingredients can’t you cook without? At the moment, it’s definitely dried chilis. Also the pit of the sapote mamey fruit. It has a beautiful almond flavor, and most people just discard it—I think it’s Mexico’s hidden secret. And the third would be kombu—dashi kombu broth. Super random, but that’s kind of me. What gap in San Diego’s culinary landscape does El Jardín fill? What we bring to San Diego is a different approach to Mexican food. What [the city has] right now as far as Mexican food is tacos from old-school taco shops, [or] everything drenched in canned enchilada sauce. It makes business sense to just do tacos and burritos and nachos, but we’re so much more than that as a culture. You go to Mexico state or Mexico City and you have some of the most beautiful food made by chefs who have traveled the world and come home. Why can’t we be that? [Mexicans] learned all these techniques from all these different places, and we made our food. My cooks are young; I’m young. We’re a contemporary Mexican restaurant with old roots. We’re trying to do our best and also be true to who we are. I want to make the food my grandma made and present it to you on a beautiful plate with greens that come from our garden. What challenges do you encounter cooking Mexican food in the United States? Being so close to the border, the theme that I constantly have working against me is the fact that Mexican food is still not perceived as something that you should spend money on. No one values Mexican food this close to the border. But I pay my cooks a living wage. I pay my dishwashers more than minimum wage because they’re taking care of the plates that I handpicked in Mexico. What do you want people to learn about Mexico when they eat at El Jardín? We lived in Imperial Beach [less than 10 miles north of the Mexican border with California, but] we were in Tijuana almost every single day growing up. I personally consider myself Mexican more than I do Mexican-American, because my parents always had us in Mexico. My dad worked in Mexico my entire life, and my mother speaks incredibly broken English and never worked in America. I have a very skewed upbringing [in that] we are more proud of our Mexican heritage than the average first-generation [family]. We want customers to come [to the restaurant] with an open mind, regardless of where they’re from. Ask us questions and be inquisitive. Learn about who we are as a culture. We do have a lot of knowledge, and we do have a lot of things to say. I always say that we have to educate people—without being pretentious, obviously. So I empower the front-of-the-house team to be the storytellers. Right now in my rewrite of the menu, I’m making it a lot more approachable for people who don’t read Spanish so they don’t fear not knowing what they’re going to get. This interview has been edited for length and clarity. Photos courtesy of KCET. This article was produced in partnership with KCET’s “The Migrant Kitchen.” A version of this article also appeared on KCET.org. Now in its third season, “The Migrant Kitchen” will air an episode profiling Zepeda-Wilkins on November 21. The trailer for the full third season is embedded below.